Well, maybe “of my own” is stretching it a bit… The first one I started with was actually this jolly roger image, which I ran through the Voronoi Stippler, and then imported into Inkscape. The plot took about an hour, which is probably way too long, as I could tell Egg-Bot was working it’s little motors out… Next time I’ll need to simplify things a bit when I create the stippling. 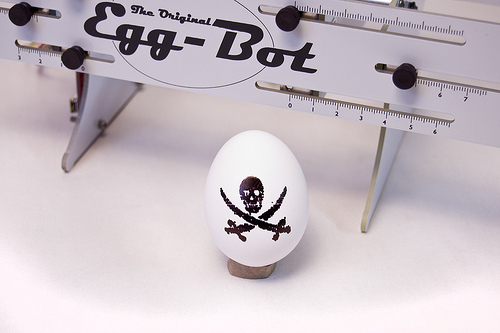 I’ll also be working on converting existing EPS images/logos to SVG files that are suitable for the Egg-Bot (and once I do, I’ll post them to Thingiverse.) For now, just keep an eye out for more egg-plotting fun right here.